This series is intended to be a tribute to my dad and all of the men and women who worked in the steel mills across America. 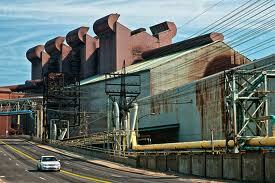 Whenever I think of steel-workers the first characteristic that comes to my mind is — Hard Work. 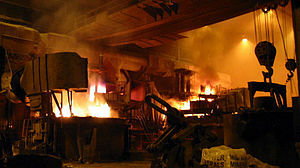 Steel mills by nature are hot, dirty, loud, and have the distinct smell of fire and brimestone. The men who work in them are a unique breed, who daily do some of the most back breaking work imaginable. 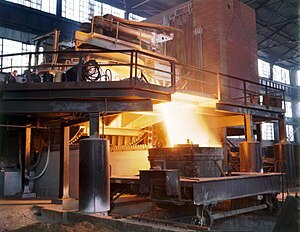 Like just about all of the men who worked at Weirton Steel during it’s heyday, my dad started out in the “open hearth” on the “labor gang.” Part of his job in the early days was to called “slagging.” As best I can describe it, a “slagger” shoveled “slag” (by products of steel making that look like rocks) on to the top of molten steel to help maintain it’s temperature. This is back breaking, hard, physical labor that is nearly foreign to us today, but dad and men like him did this kind of work every day. If you want to get an idea of what the conditions and work was like when my dad started in the mill, click here to check out a Youtube video about the Steel mills in Youngstown, Ohio made in 1944. My dad was living proof that by working hard you can overcome a great number of disadvantages. Dad was a high school drop who didn’t have any family connections within the mill. Both of these were huge disadvantages in his day, but he overcame them both through sheer hard work and determination. Dad started out on the bottom of the heap in the mill and worked his way up to become a “turn foreman” before he retired. No one gave him this position. He worked for it and earned it through hard work and dedication over a 40 plus year career in the mill. Growing up as his son, this was not always an easy lesson for me to learn. During the summer months, when my brother and I were off from school, Dad would give us a list of chores to finish up and when he got home from work that afternoon he expected the jobs to be done. If he told me to “cut the grass” before he left for work then the grass better be cut when he got home. He encouraged me to go to college and to get a good education but he always stressed that to succeed you needed to work hard because education alone was not enough. I remember when I got my first job working in a grocery store. This work must have seemed rather tame to my dad who was used to working in a place filled with constant danger, but he still stressed the importance of working hard. On my first day of work, dad told me to “that man has given you a job and he expects you to give him a full days work, so don’t let me find out you go out there and goof off all day.” Honestly, I don’t think that I have ever worked as hard as men like dad and others who worked in the steel-mills but I am thankful that he instilled in me a strong work-ethic. One of the Bible verses that dad used to teach me this lesson was Colossians 3:23 “Whatever you do, work heartily, as for the Lord and not for men.” In the early days of his work in the mill, Dad worked primarily out of necessity and was motivated somewhat by a sense of fear. 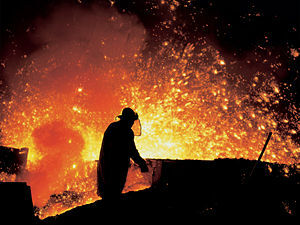 The Steel mills were the best jobs available where we lived during that time and dad knew that without his job we couldn’t survive, therefore, he worked hard to make sure that he kept his job. Somewhere in the middle he fell in love with the process of making steel and I am genuinely convinced that he worked hard because he actually enjoyed making steel. But towards the end of his career, as failing health and the natural process of aging took its course, his work took on a different meaning. As I will share in a later post, the most important thing that ever happened to my dad was becoming a follower of Jesus Christ and this event changed the way that he viewed his work. Hard work for my dad was just as much a part of worshipping God as was going to church on Sunday. When I went off to work for the first time, dad was careful to remind me that in addition to owing it to my boss to do a good job, I also needed to keep in mind that no matter my job was I needed to do it like I was doing it for Jesus. It makes me sad to think that somewhere along the way we’ve lost the work ethic that men like my dad possessed. Too many of my generation today think that simply having an education should be enough to get them ahead and sadly many are not even willing to work hard in order to get the education. Now days kids no more about “twerking” than working and this could very well prove to be the downfall of our nation. The closest many people get to hard work today is watching someone else do it on the Discovery channel. 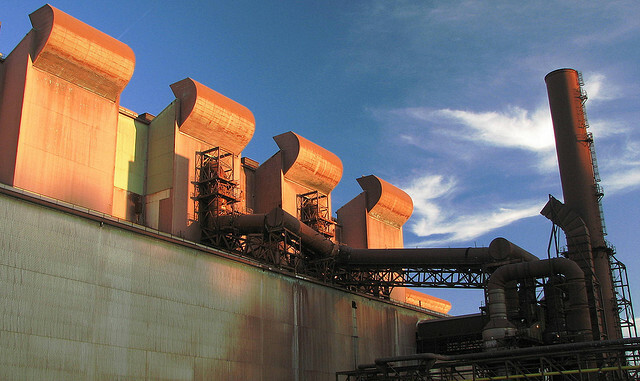 The other day I was looking at a picture of an old abandoned steel mill and I was wondering what would happen if we decided to reopen the steel mills and factories across the country. Sadly, I’m afraid that we wouldn’t be able to find the workers who would be willing to do the jobs that our fathers and grandfathers did every day of their lives. America was built on ingenuity and hard work. Our forefathers knew that one without the other couldn’t move us forward. If we want America to be great again we need to rediscover our “work ethic” and start doing our jobs with a sense of pride and dedication. We need men and women who are both well educated and hard working!